Gay male AIDS survivors, in particular, are often ignored when recognizable kinship ties do not exist. Inappropriately, society prescribes that close, meaningful relationships are only possible among immediate family. Yet, many lovers of AIDS victims have enjoyed lengthy, enriching, monogamous relationships with the person who passed away. Family members, however, sometimes deny the significance of that relationship. As a helper, acknowledge the impact of the death on the bereaved lover. Let the survivor “teach you” about the meaningfulness of the relationship. Be nonjudgmental as you reach out with open ears and a loving heart. Parents, brothers, sisters, grandparents, uncles, aunts, spouses and children of AIDS victims are often ignored. Why? Due to the nature of the demise, it is sometimes kept a secret. If the death cannot be talked about openly, the wounds of grief will go unhealed. As a caring friend, you may be the only one willing to be with the survivors. Your physical presence and permissive listening create a foundation for the healing process. Allow the survivors to talk, but don’t push them. Let them know you are ready to listen if, and when, they want to share their thoughts and feelings. As I mentioned before, the grief of AIDS survivors is naturally complicated by society’s attitudes regarding the disease. The sad reality is that this situation magnifies the grief at a time when survivors’ typical support systems are either not available or potentially damaging. Accept that survivors may be struggling with explosive emotions, guilt, fear and shame well beyond the limits experienced in other types of death. Be patient, compassionate and understanding. If you allow them, AIDS survivors will “teach you” about their feelings regarding faith and spirituality. If faith is a part of their lives, let them express it in ways that seem appropriate. Many survivors disenfranchised in their grief rely on their spirituality as a way to find love and acceptance denied them by family and friends. Survivors may also need to explore how religion may have complicated their grief. They may have been taught that AIDS results from sin and they may have internalized this inappropriate assumption. Whatever the situation, your presence and desire to listen without judging are critical helping tools. To help AIDS survivors, you need to have an abundance of patience. You may even become the target of their explosive emotions. 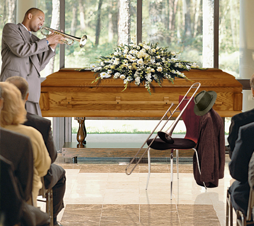 Realize that the grieving process takes time and allows mourners to proceed at their own paces. Don’t force your timetable for healing or set expectations about how they should respond. If survivors become silent or remote, don’t push with questions. Turning inward is a part of healing in grief. Often total silence is absolutely necessary.